Help expectant parents find the right prenatal education program for them! The Best Start Resource Centre has launched its awareness campaign Children See. Children Learn. We connect you to current trends in preconception health, prenatal health and early child development and education. Contact us if you have a question or sign up for our electronic bulletins and online networks (listservs). We offer a variety of resources that range from fact sheets, brochures, decals, posters, videos to program planning guides and reports. Browse and download them free of charge, adapt them, or refer your clients to them! Pregnancy and alcohol don’t mix. Visit our newly revised bilingual alcohol and pregnancy website for parents AND service providers! Make sure families know where to find our trustworthy resources: distribute our bilingual flyer for parents! 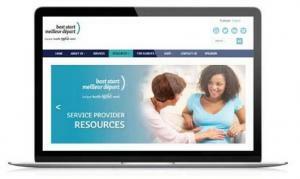 Best Start by Health Nexus, formerly Ontario's Maternal Newborn and Early Child Development Resource Centre, supports service providers working on preconception health, perinatal and newborn health and early child development and education.